I’m celebrating the release of my first audiobook narration, Black Sails, White Rabbits; Cancer Was The Easy Part, by holding a raffle! If you’d like to win a FREE copy of this audiobook, just make a comment on this post including your real name before 11:59pm on May 30th, 2016. I will compile all the names, pick one at random, and announce the one lucky winner the first week of June. Of course, if you don’t want to wait and you’d like to show your support now (not to mention hear a rippingly good tale), this audiobook is now available on Audible.com, Amazon.com, and on iTunes. If you make this audiobook your first purchase (not freebie) on the Audible website, that helps me even more! 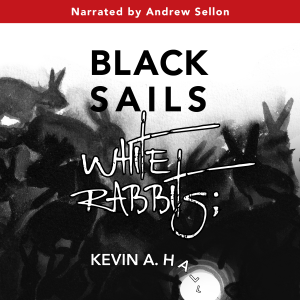 Black Sails White Rabbits is the extraordinary autobiography of sailing athlete Kevin A. Hall, whose dreams of competing in the Olympics and raising a family were put on hold at the age of nineteen when he was diagnosed with testicular cancer. Then bipolar disorder. Then testicular cancer again. And Kevin’s bipolar disorder takes the form of what is now called “Truman Show Delusion”–when an episode hits, he thinks he’s the star of a global TV program. How Kevin has weathered his illnesses, faced his demons, and achieved his goals makes for one heck of a tale–at turns darkly funny, frightening, surprising, sweet, and moving. Kevin is a super-bright man, and he doesn’t pull any punches; you’re right there with him as it happens–and that’s especially true of the audiobook version. He’s not only a great sailor–he’s a terrific storyteller. I’m honored that Kevin selected me to narrate his book. He had his choice of some extraordinary talent, but when he attended the Alice150 international convention with our mutual artist friend Wendy Ice in October 2015 in NYC, he saw me perform my new one-man show Through the Looking-Glass Darkly, and decided I was the man for the job. I’m thrilled Kevin is so happy with the resulting audiobook. If you want to enter my May 2016 raffle, remember to make a comment on this post before June 1st. If you want to buy the book now, you can use the links included in this post. If you enjoy the audiobook, and know others who would, please do share this information with them. Thank you for your support, and good luck!! Big News: I'm in the "Cheers Live On Stage" National Tour!